Our dog, Delilah, has so many episodes of freaking out over something she sees or hears through our doors and windows that we have grown numb to her outbursts. It is rare that I bother looking anymore to see what squirrel/rabbit/bird is triggering her tizzy. Of course, there was the time last summer when we finally checked and discovered she was barking about that group of 10 cows that had found their way up near our bedroom window. Her reaction that time was totally justified. Last night, we were up in the loft when she revved up over something she spotted in the back yard through the French doors. Since I had a similar view without needing to get up, I turned to check it out. There was a raccoon sauntering across our yard in broad daylight, unfortunately, directly toward the chicken coop. 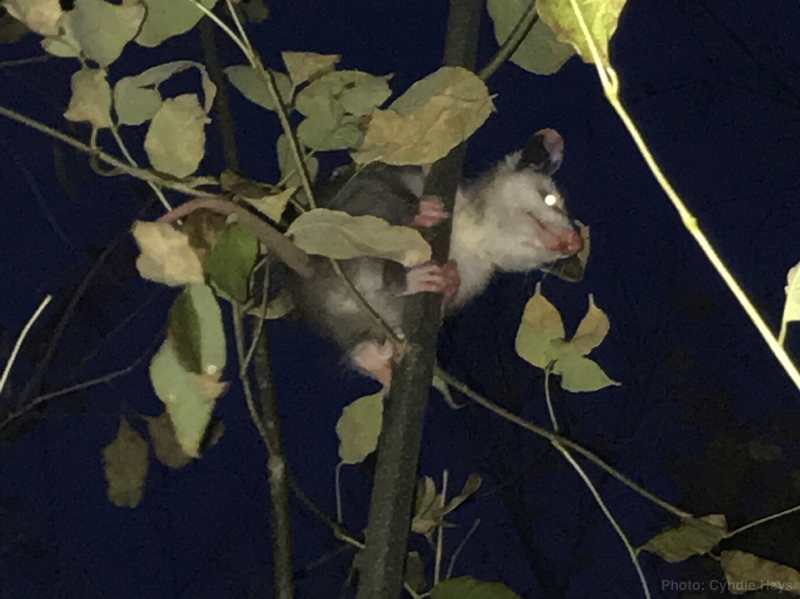 I rushed down to track its path and was able to see it climb up a large tree and disappear, high up inside the main trunk. Just a short distance further ahead, the chickens were calmly combing the deep leaves on the ground among the trees. Our chicken coop, when buttoned up for the night, is well secured against raccoon intrusion. Regular readers may recall we got duped by a possum that snuck inside during the day and killed one of our hens over night after we shut the door at sunset. Now we check all the nooks when we count the chickens and close the door for the night. 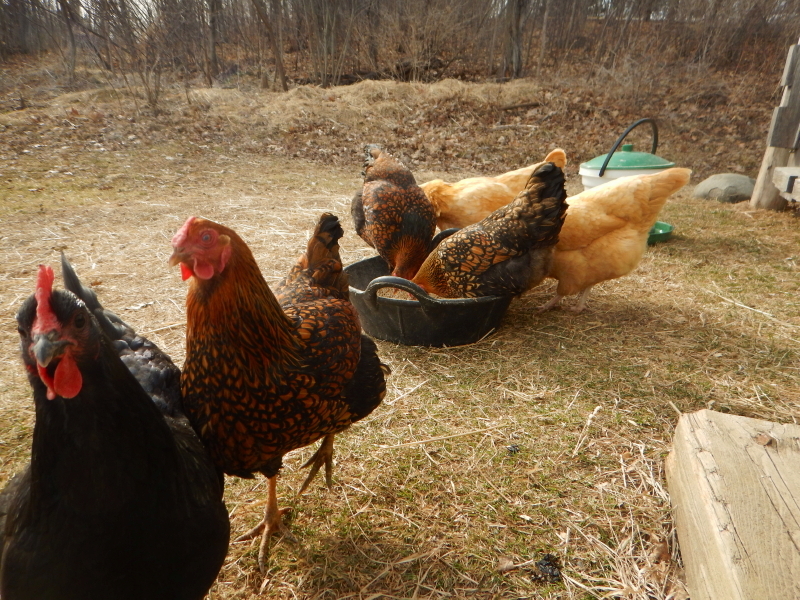 The usual evening report used to simply list the number of hens secured, but now it always includes the affirmation of the coop being predator-free, as well. Unfortunately, since we have chosen to free-range our chickens, they are easy prey during daylight hours. One reason a raccoon will be out during the daytime (other than maybe being sick with rabies or dysentery) is because of hunger. That is not a good omen in such close proximity to where our chickens hang out. I tossed a treat of dried mealworms in the pan of feed yesterday afternoon. We collected seven new home-laid eggs yesterday. At least the hens are putting those worms to good use. 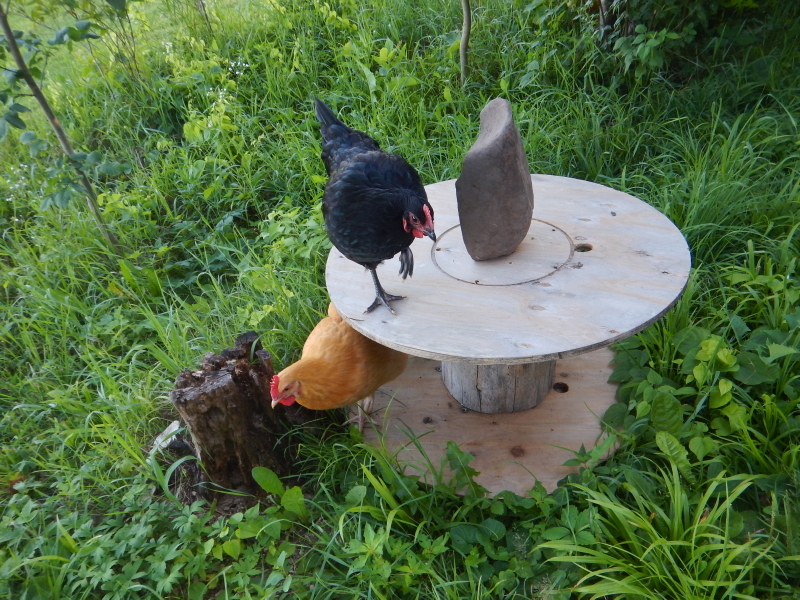 Last week I wrote about one of our Buff Orpington hens who we suspect scrapped with the possum that had gotten into the coop, and has been behaving oddly ever since. It is not clear whether it is a result of exclusion by the rest of the brood, or an act of her own choosing, but she has become a loner from the rest of the bunch. In the coop, she has taken to staying in one of the nesting boxes, day and night. There is no obvious sign that she is being picked on (pecked on?) by the others, but she repeatedly sets herself apart. 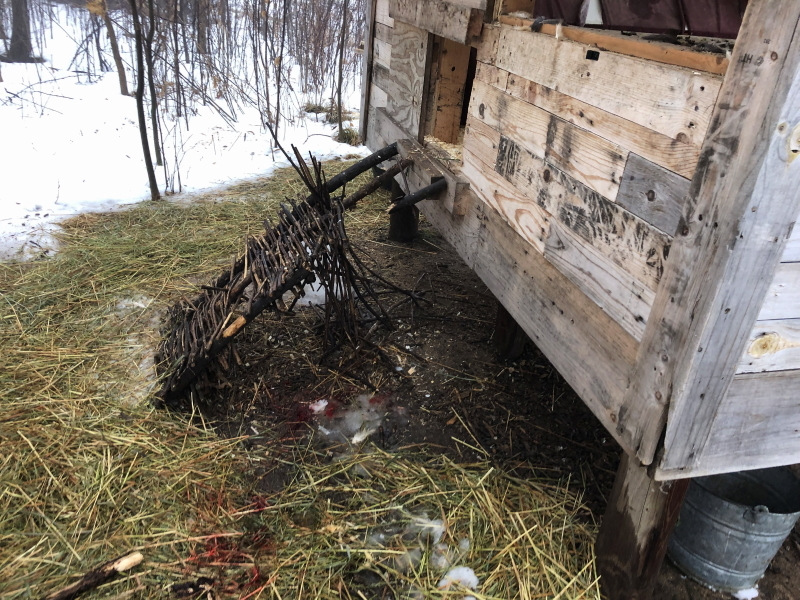 For the most part, the chickens have remained in the coop for over a week while the winter has raged, first with an epic Arctic chill and then subsequent days upon days of snow. More than once, we have opened the chicken door when the harshest temperatures eased. They’ve showed little interest in dealing with the snow, …or so we thought. 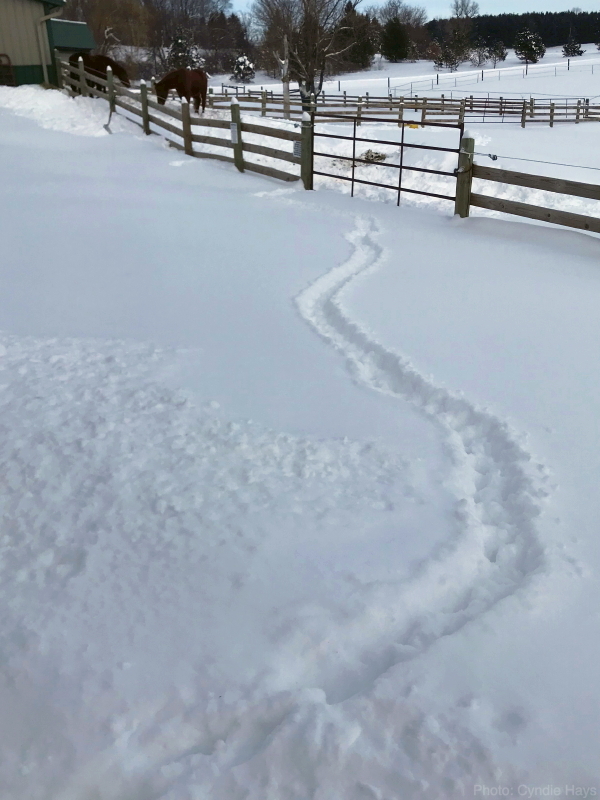 Yesterday, Cyndie came upon a most unusual trail of animal tracks in the deep snow. 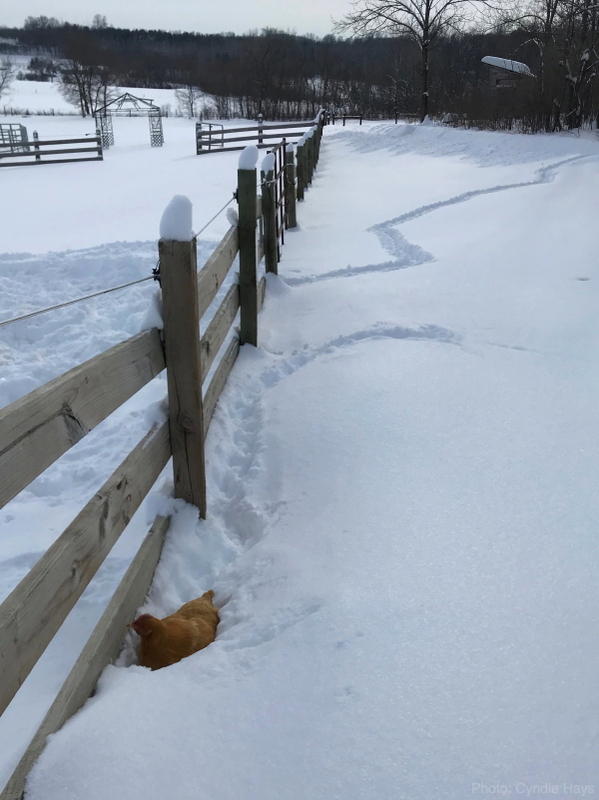 She worried that it was evidence of a fox stalking our chickens. She checked the coop and counted hens. There was one missing, but there were no obvious tracks, even though the door was open. On her way back to the barn, she spotted it. That loner Buff Orpington was sitting by the paddock fence, almost as if stuck in the snow. The weird trail was the path that hen had traversed through the deep powder snow. She must have almost been swimming to make forward progress. It had to have taken a monumental effort to get as far as she did. I suspect she stopped out of exhaustion. Cyndie couldn’t get to the hen without first getting a shovel to make her way through the knee-deep snow. She picked up the loner and held her close to warm her. It’s hard to imagine what drove that Buff to attempt crossing the deep snow toward the barn overhang, other than this ominous behavior of isolating herself from the rest of the brood. Cyndie put her back in the coop, setting her up on the roost in hopes of re-training her to not spend the nights in a nest box. That didn’t last, as, by evening, the Buff was back in a box again. A bit of research turned up a variety of possible internal maladies that may be the cause of her isolation. We are going to let time dictate an outcome, while doing whatever we can to keep the poor girl comfortable. None of them are laying eggs of late, due to the shortened hours of winter daylight, so it’s difficult to pinpoint egg related issues, if that is what’s ailing her. Meanwhile, the last visit of the night last night turned up new tracks in the snow that, this time, looked suspiciously fox-like. It is no surprise that the deep snow cover we now have has challenged predators to seek easier prey. There is plenty of drama to be interpreted in the fascinating markings vividly appearing in all this new snow blanketing our fields and forest. We would prefer that it not involve the taking of any of our animals, but nature will take its course. It was a gloomy and foggy morning. I offered to build a fire in the fireplace while Cyndie went out to do morning chores, tending to our animals. When I stepped out on the slippery deck in my house slippers to gather kindling, I picked up the unnerving sobs of pain and sorrow wafting within the soup of grayness that covered our land. I called out to the fog, not having any idea which way the sound was coming from. I moved around on the deck, trying to get a sense of which direction her cries were coming from. It changed from right to left. I called again and again, but she didn’t reply. I grew angry because I wanted to know if she was injured and what I needed to do in response, standing now on the icy driveway in my slippers. She was walking upright, and carrying something, so I guessed she was alright. The most likely problem was a dead chicken. Finally, I demanded a response and she angrily growled that she had killed a possum that had gotten in the chicken coop and killed one of our Australorps. How did it get in? Cyndie didn’t know. There was no indication of disruption around any of the doorways or windows. The logical deduction: the critter had already snuck inside when the chicken door was closed last night. Never underestimate the wrath of a mother reacting to harm of her precious brood. With lethal vengeance, Cyndie unleashed her grievance with a shovel, destroying my custom ramp in the process. She admitted that any neighbors outside at the time probably heard an earful of expletives howled along with swings of the shovel. 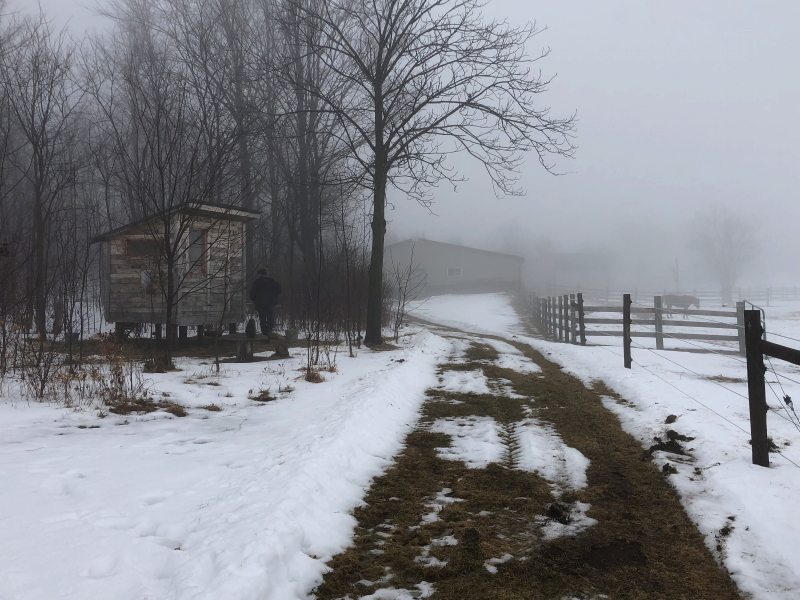 There are now eight surviving hens and they seem very happy to be out of the coop, soaking up the above-freezing temperatures that are the source of all this fog. The temperature climbed 75 degrees from Thursday morning’s -36°F to yesterday afternoon’s +39°F. Our thermometer reveals it didn’t drop back down below freezing overnight here, so the melting and thawing is in full swing. The horses seem pretty pleased with the change, too. 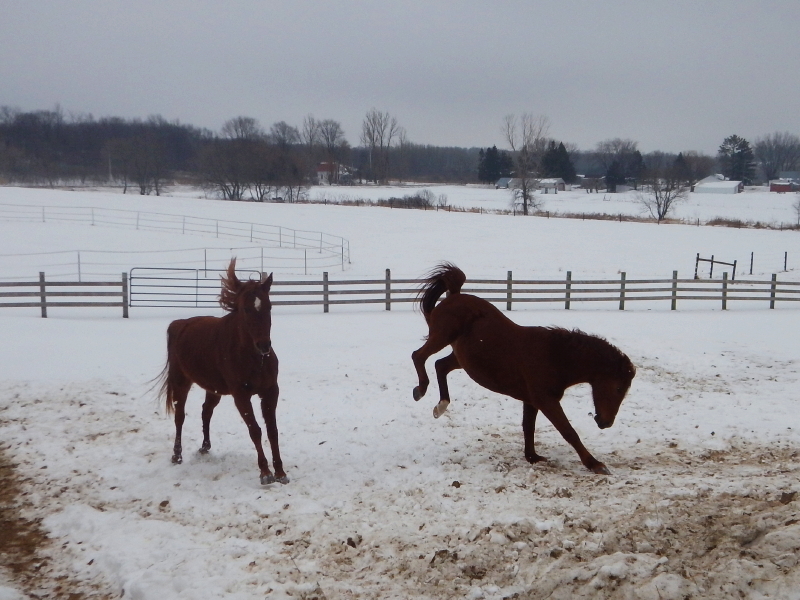 Free of their blankets, they were romping all over the paddock yesterday, running and kicking with gleeful energy. This morning, Cyndie and I aren’t really feeling as much glee. We are left wondering if recent events mean we will need to institute a full nook & cranny search of the coop every night from now on when we close the chicken access door at dusk. I guess it beats the alternative we faced this morning. Our departure for a 9-day getaway to visit Cyndie’s parents in Florida was still a day away last night, but both of us picked up a powerful vibe that Delilah was already beginning to mope as a result of our telltale activity. 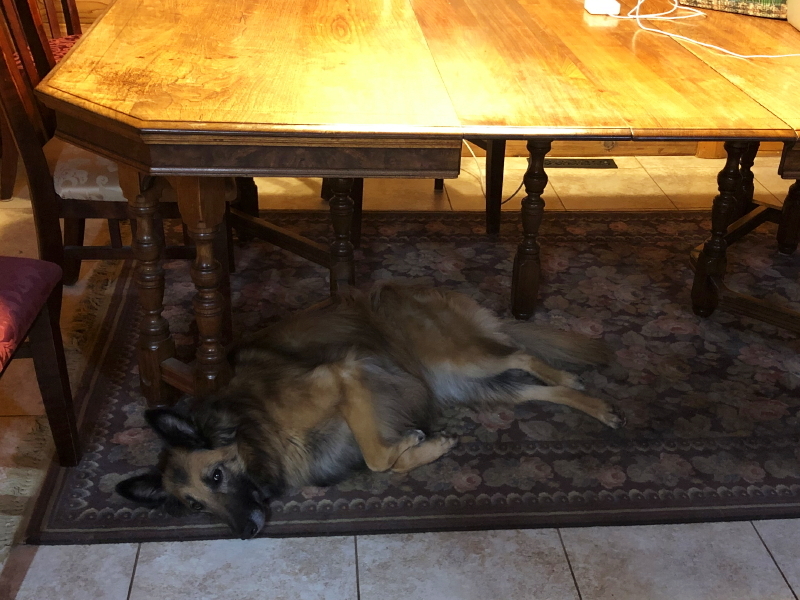 She laid under the table and watched us with her eyes, without picking up her head. Suitcases had been brought out of storage. Cyndie was kicking into high house-cleaning gear, and both of us were mentally grinding through virtual lists of tasks to be done, items to be packed, “i”s to dot and “t”s to cross. Delilah has witnessed this scene before. One of our newer house and animal sitters, Anna, will be taking care of our place while we are away this time. I’m hoping the weather will be uneventful and the predators all stay away while she is on duty. Wouldn’t it be a shame if we lose a hen (or hens) during her stay? I’ve tried to point out to her that it can happen at any time, hoping she won’t suffer too much if a loss occurs on her watch. We drive to the airport this afternoon for a flight out around the dinner hour, departing just as a mass of colder air with a chance of some snow is expected to pay a visit. Guess it’s not the worst time to be escaping to Florida. I’ve been pondering what I might choose to do for blog posts while we are away. One possibility that keeps tugging at me is the challenge of choosing one photo per day to convey what we are experiencing. At the same time, I assume a week of leisure might free me up to do more writing than usual, so maybe I don’t want to restrict myself to a single picture. Either I’ll write more, or I’ll take a break and write less. We’ll just have to wait and see what captures my fancy, after I settle in to that eastern time zone with the warm, humid air. One way or another, you can rest assured that, for the next week, I will somehow be sharing the most delectable morsels of our adventures in Florida, visiting Cyndie’s mom and dad. It’s a complete mystery to us, and an entirely unexpected circumstance for the demise of another chicken. I fully expected it would be a predator killing and running off with our next victim. 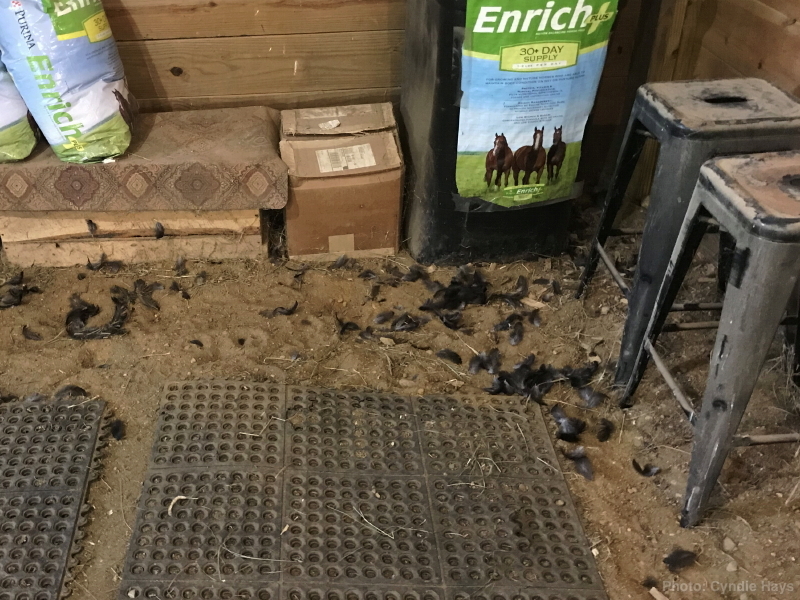 Jackie found an ominous scattering of black chicken feathers inside the barn yesterday afternoon when she arrived to tend to the horses. We leave the bottom half of the split doors closed all day to dissuade the chickens from getting inside and leaving their calling cards all over the barn. They are certainly capable of hoisting themselves high enough to get up and over the half doors, but we have yet to catch them doing so. Our first question is, then how did she get inside? Did she come in of her own accord? The scattering of feathers were generally confined to two separate spots. What caused the loss of feathers? Eventually, the trail of feathers led to the discovery of a body, curled up like a little napping kitty, back behind a stack of rakes and shovels leaning against the wall. The deceased hen was completely intact, with no visible wounds. Did it get inside on its own and then have a panic attack? Did a predator chase it inside? Carry it inside? Would a potential predator leap over the door? A cat would. Did the chicken come inside and then surprise a predator inside? Most likely guess would be a neighbor cat that was trespassing in our barn. This would have happened sometime in the middle of the warm sunny day yesterday. Cyndie and Jackie said it was really windy around here during the day. Did that have anything to do with how or why the chicken ended up in the barn? 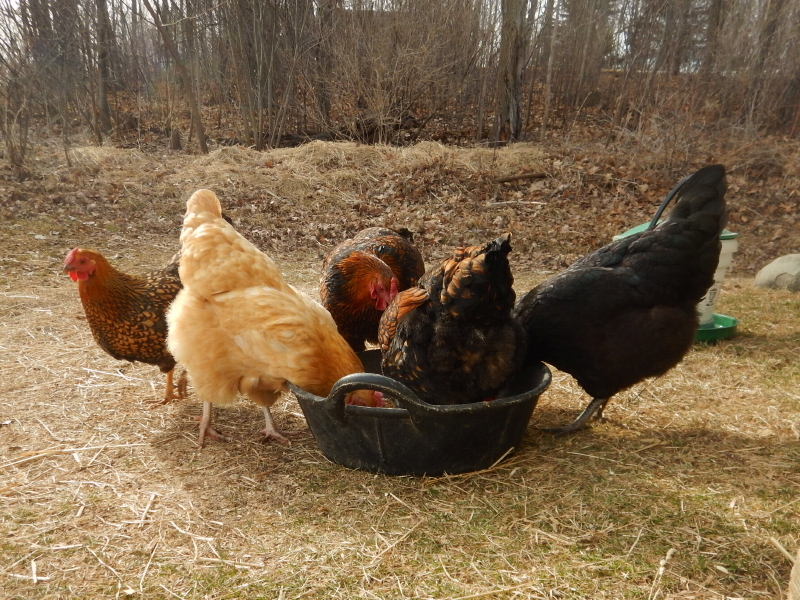 We are now down to 9 chickens, three each of the three breeds we purchased. In fact, we only paid for nine. We received 1 extra chick for each breed back in March. This marks the end of the spares provided to cover for possible loss due to any hardships for day-old chicks traveling through the US Postal service. We received other news from Jackie last night. After a couple of weeks back in classes at UW River Falls, she has decided she needs to move back on campus. Our live-in helping hand will no longer be available to provide the coverage for us like she did through the summer. Jackie has allowed us a good number more weekends away than we’ve been able to achieve previous years. Our basement “apartment” may be back on the market for someone who knows and loves horses. Also being able to handle a diva of a Belgian Shepherd would be an added plus. Lately, we’ve been wondering how close our chickens are getting to their egg laying stage. One of the signs is when the wattle and comb develop and reach full color. Ours are growing at various rates. 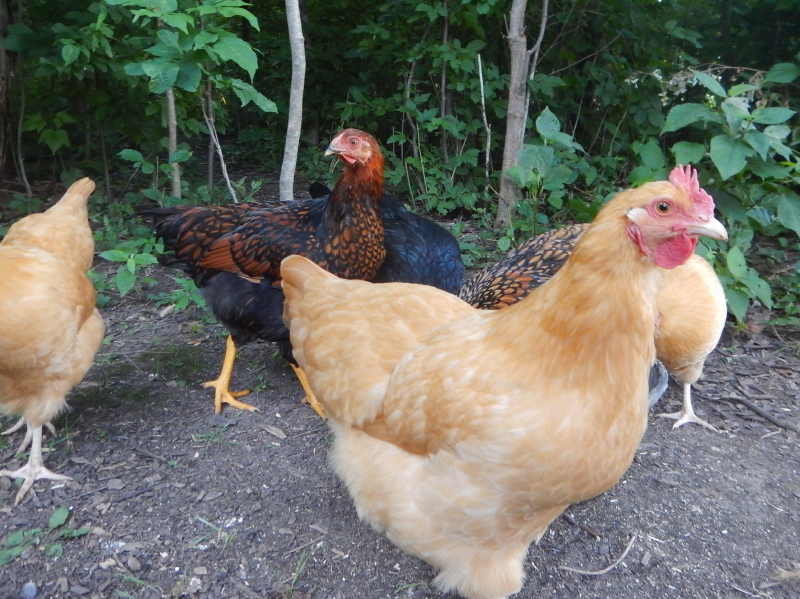 Even among the single Buff Orpington breed, there is a range of maturity. I checked my blog posts from last year to see when the first egg showed up. It was August 8. This year’s batch were all born a week earlier, so if their growth is similar, the beginning of next month could be the start of the daily egg gathering adventures. I sure hope the predators around here stay focused on wild game for a good long time. 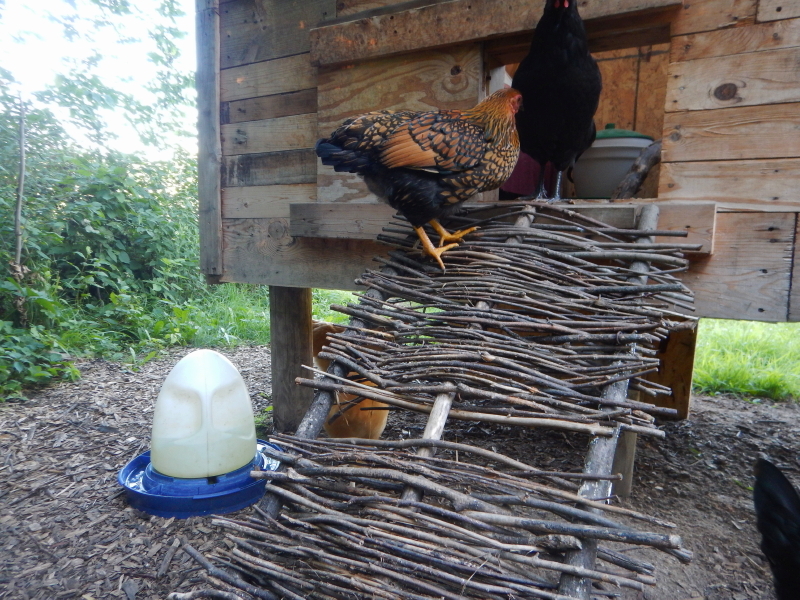 The other day I noticed these twelve have taken an interest in dismantling my woven stick ramp into the coop. I’ve patched it up a few times, but they always go back to pulling out sticks. If they keep it up, it’s going to be a BIG step to get in to roost at night. Maybe they know something I don’t. How big a gap would it take to discourage snakes from wandering up to get inside? Just because they are chickens doesn’t mean they aren’t able to make an occasional intelligent decision, don’t you know!